Leicester had its first Anglo-Saxon bishop, Cuthwine, in 680 AD with an Anglo-Saxon building. The church was dedicated to the fourth century saint, Martin of Tours, a Roman soldier who converted to Christianity and led a holy life. Two hundred years later, in 870 AD the Danes invaded and drove the bishop away, leaving Leicester without its own bishop. In 1072, the Normans put the people of Leicestershire under the care of the Bishop of Lincoln and later by the Bishop of Peterborough. In 1086, there is the first recorded mention of a church of St. Martin and the construction of a Norman church was begun to replace the Anglo-Saxon building. In the thirteenth century, the church was rebuilt as Leicester Abby and the Abbey appointed the vicars at St. Martin’s. Also, in the thirteenth century, the Great South Aisle was added, englarging the church. In the fifteenth century the nave and chancel were extended. It became a ‘Civic Church’ and cultivated strong links with the merchants and the guilds in the surrounding area. During the Reformation, St. Martins was stripped bare of statues, vestments, screens and stained glass. In 1634 and 1642, the church was visited by King Charles I. The spire was added to the Norman tower in 1757. The building was much restored by the Victorians with the tower and roof rebuilt and a new 220 foot spire and gilded rood screen added in 1860. 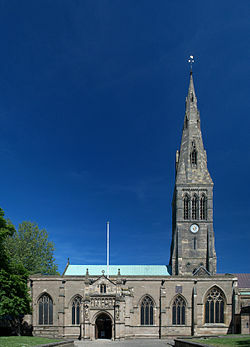 In 1927, Leicester was finally appointed its own bishop again and the Church of St. Martin became Leicester Cathedral. Leicester Cathedral is the only Cathedral in Britain having a memorial to King Richard III, who died at the Battle of Bosworth Field in 1485. His body was buried in the churchyard of the Church of the Grey Friars in Leicester. It was alleged for many years that King Henry VII had his body dug up and thrown in the River Soar. But a recent excavation of the Grey Friars site, (formerly under a car park) has found the bones of Richard III. His remains will be reinterred in Leicester Cathedral on March 26, 2015. Agreed Clanmother! It’s one of the reasons it’s so disappointing Henry VIII destroyed all these precious buildings and their history. It is enough to make me weep!! !